Class 188, who experienced those glories with me. The selected speeches and articles herein are gifted to Philadelphia’s Central High School by Eugene (Gene) Rotberg, Class of 188. Most of these speeches and articles deal with matters relating to globalization; financial excesses, crises and reforms; derivatives and strange accounting conventions; poverty and its geopolitical implications; uncertainty, vulnerability and risk; and the role of incentives and peer pressure in the financial markets. A basic theme is: “Be modest. The only perfect hedge is in a Japanese garden,” and as I wrote over 40 years ago: “Learn Chinese!” These materials are for the use of faculty, students and alumni of Central High School and for researchers and academics. The materials are in four parts. The first part, “Globalization, Poverty and Protectionism,” deals with the economic conditions in the developing world which led irreversibly to globalization and trade liberalization. The second part, “Finance, Capital Markets and Systemic Risk,” deals with the world of finance over the last 50 years, the impact of derivatives and financial engineering, systemic risk and the growth of worldwide capital markets and its role in providing a vehicle to facilitate economic growth. The third part, “Emerging Countries and the Debt Crisis,” deals with the debt crisis of the 1970s/1980s (and more recently Greece) which put the world banking system at risk. The fourth part includes published articles that primarily describe my role as Vice President and Treasurer in the Bank’s financial operations. These materials can be accessed through this website, www.generotberg188.com, or by hard copy at the Central High School library. 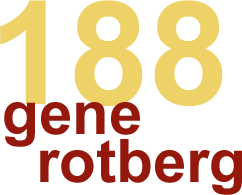 A chronological and more extensive compendium over the last 50 years can be reviewed by accessing Gene’s website, www.generotberg.com.